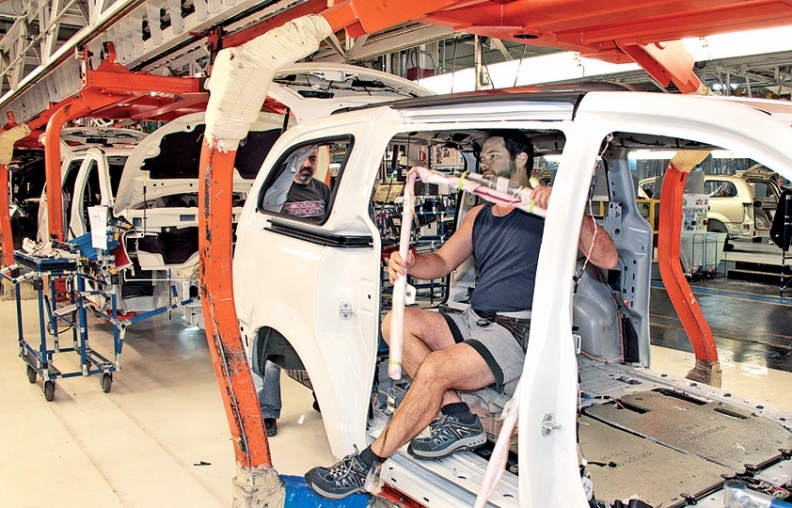 An employee installs interior components on a minivan at Chrysler's plant in Windsor, Ontario. Chrysler is testing a no-bid system with suppliers for its next minivan, due in 2015. DETROIT -- Chrysler Group is using its next minivan to pilot a collaborative, no-bid purchasing system that guarantees favored suppliers a profit but requires them to open up their financial books. Though "a couple dozen" suppliers are exploring the idea, Chrysler purchasing boss Scott Kunselman says none have signed a contract. The system requires a lot of trust on financial matters between the automaker and many of its suppliers. Kunselman acknowledges that is a work in progress. Chrysler has spent more than a year designing the successor to its Dodge Grand Caravan and Chrysler Town & Country minivans, which are due to be replaced by a single minivan in 2015. A report last month in The Detroit News suggested that the current Grand Caravan could be continued for another two years. Chrysler has refused to comment. The presourcing arrangements between an automaker and supplier are designed to allow both to cut engineering costs, build trust and improve long-term planning. They are common among suppliers at Honda Motor Co. and Toyota Motor Corp., but haven't caught on among domestic suppliers. "This is really kind of a pilot," said Kunselman, 50. "In many cases, I think we'll have good success because we've had a couple dozen folks who have raised their hands and said that they were willing to take part in this. So we're doing that now." Kunselman: Chrysler works to build trust. Long-term, no-bid agreements give suppliers more predictable revenue, allowing them to invest with reduced risk. And suppliers say they provide their best technology to automakers that are loyal to them and offer the best profit opportunities. For automakers, the no-bid agreements help ensure an uninterrupted flow of parts and access to a supplier's best technology. Kunselman said last fall that he wanted to move many of Chrysler's supplier relationships away from bidding and into presourcing. Doing so would help the automaker improve relations with its 3,000 suppliers, which suffered under previous Chrysler owners Cerberus Capital Management and Daimler AG. It also would ensure that Chrysler had access to suppliers' best technologies and production capacity. Predictably, though, Kunselman said the greatest hurdle to implementing his plan is building trust with suppliers so they reveal financial details of their operations. "That's the key to the relationship: Are we ready to operate on a transparent basis, so that, for example, financial things aren't the things that we worry the most about," Kunselman said. "That's the real opportunity -- to take the negotiating off the table and make sure that we both agree on what we need to do." With no contracts signed, it's hard to know whether Kunselman's presourcing pilot on the next minivan will succeed. Some suppliers are understandably reluctant about revealing their development costs, production practices and profit margins to an automaker. Other suppliers would rather the information remain private and take their chances in bidding. So Kunselman says Chrysler will make progress on the initiative where it can. "We picked people that we think we already have this going with," he said. "I wasn't going to take on the hardest one first. I figured that we'd start out by understanding first the ones that we think will work." That has given a natural advantage to incumbent suppliers, Kunselman said. "We don't want to put crazy hurdles in the way, so generally you pick people that are ready to succeed," Kunselman said. "They've got capacity, they've got technology, they've got proximity to the facilities, and many of them, as you can imagine, are probably incumbents on the vehicle today."